Zinc is an elemental metal. It is listed on the Periodic Table as "Zn," with an atomic number of 30 and an atomic weight of 65.37, and it melts at 788°F (420°C). Zinc is usually a gray metallic color, but it can be polished to a shiny silver luster. In nature, it is only found as a chemical compound, not as pure zinc, and can be used as a raw material for castings and coatings. During the era of the Roman Empire, people used zinc to alloy copper into brass for weapons. In this crude process, the zinc was captured by the copper during the heating of the ores, though little was realized at the time about the importance of zinc in metallurgy. The name zinc may be derived from the German word "zinn," which means tin. The scientific discovery of zinc is credited to Nadreas Sigismund Marggraf, a German chemist who isolated pure zinc in 1746. The first production facility, or smelter, was founded in Bristol, England by William Champion shortly thereafter. Only about 5% of the world's zinc supply is mined in the United States, with the balance coming primarily from India, Mexico, and Canada. Approximately 6.7 million metric tons of zinc ore are produced worldwide. Roughly two thirds of the zinc used in the United States is imported. Zinc is primarily used for galvanizing steel against corrosion, die casting of intricate machine parts, and in batteries and other electrical applications. Zinc is also alloyed with copper to form brass. Galvanizing steel involves applying a thin coating of zinc to all exposed surfaces of the steel to guard against corrosion. Zinc offers excellent corrosion resistance because it is more easily oxidized by the atmosphere. Oxidation occurs when metal is exposed to air or water, and electrons from the metal transfer to the oxygen. When zinc is tightly bonded to steel, the zinc frees up its electrons more readily than the steel, leaving the stronger metal beneath intact. The application of the zinc coating is accomplished by dipping the steel into molten zinc or by electrolytic plating of the steel with zinc, much like chrome plating. Die-casting alloys typically contain 96% zinc and 4% aluminum. The die-casting process uses a two-piece steel die and a casting press to hold the die halves together during injection of the molten metal. Inside the steel die is a cavity that has the negative image of the part to be cast. The molten metal is injected into the cavity under pressure, accurately filling the entire void. The metal cools, and the press opens the die halves, revealing the formed part. The zinc cast parts are very close to the desired shape, requiring little machining before they are placed into an assembly. Typical applications include copier, aircraft, and medical instrument parts. Automobile makers use zinc die castings for emblems, moldings, door handles, and brackets. Zinc die castings are easily chrome plated for durability and appearance. pure zinc, are bolted to aluminum marine engines. During operation in water, especially salt water, the oxidation forms a weak electrical current, which may corrode the hull and engine parts. Since zinc is easily oxidized in the presence of this electrical current, it "sacrifices" itself by corroding quickly, consuming all of the electrical imbalance in the ship. The remaining aluminum hull and engine are not corroded as a result. As it is consumed, the anode must be replaced to assure continued protection. In an application similar to the sacrificial anode, zinc is used as a component in battery production. The dry cell battery creates a chemical reaction with zinc in a metal housing (or "can") that results in a voltage potential between two connections. An electrical device, such as a flashlight or portable radio, can be connected to the battery and powered by the electricity produced. Thus connected, the reaction maintains the electrical current for the duration of the available chemical reactants. Zinc as a compound is used in pharmaceuticals, rubber, cosmetics, paint, and ceramic glaze. Other compounds use zinc in cathode-ray tubes, soldering flux, and wood preservatives. 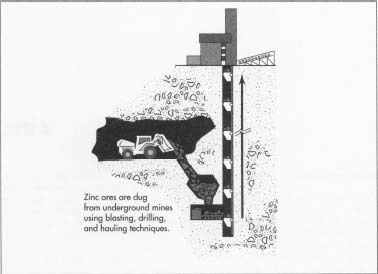 1 Zinc ores are dug from underground mines using conventional blasting, drilling, and hauling techniques. The ores occur as zinc sulfide (also called sphalerite), zinc carbonate (smithsonite), zinc silicate (calimine), and in compounds of manganese and iron (franklinite). Zinc ore is sometimes mined in conjunction with silver or lead ores. In addition to the ore itself, oil and sulfuric acid are required for the breakdown of the ores; and electricity, coke, or natural gas are needed to provide the heat energy for smelting. attach themselves to the bubbles. The operation is performed inside a vat and agitated with an impeller. The rotating impeller draws the air down the standpipe that surrounds the impeller shaft and dissipates it throughout the mixture or "pulp." The zinc rises to the top and the residue stays in the bottom of the pulp, since it cannot adhere to the bubbles. Automatic scrapers remove the mineral-laden froth containing the zinc. 3 The froth is filtered to remove the water and liquid oils. The paste-like remainder is mixed with lime and sent to a furnace. The furnace roasts the mixture at 2500°F (1371°C), which fuses the minerals into solid chunks called sinter. At this point, the material has been completely converted to zinc oxide. 4 The next reduction process uses a blast furnace to melt the prepared ore into its elemental components. The blast furnace is fueled by electricity, coke, or natural gas, which generate temperatures of up to 2200°F (1204°C). This, however, also generates carbon dioxide, which recombines with the zinc as it cools to re-form zinc oxide. To reduce this reformation, the zinc is sprayed with molten lead while it is still hot. The lead, at 1022°F (550°C), dissolves the zinc and carries it to another chamber, where it is cooled to 824°F (440°C). At this temperature, the lighter zinc separates out of the lead and is drained off the top. The lead is reheated and returned to the blast furnace. 5 Further metal improvement can be made by keeping the zinc molten and undisturbed for several hours. 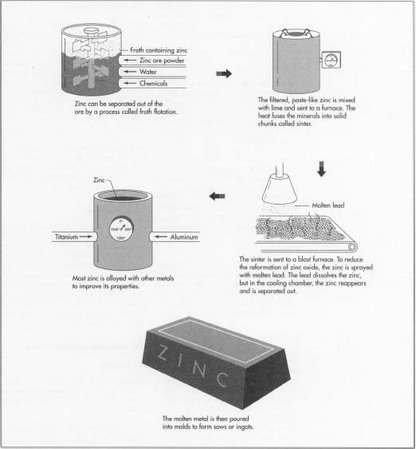 In this state, iron and other contaminants settle to the bottom, allowing the almost pure zinc to be carefully drawn off the top and cast into ingots. 6 Most zinc is alloyed with other metals before use to improve its properties. Alloying involves remelting and mixing the zinc with other metals in precise proportions. For example, approximately 4% aluminum is added to improve casting quality and die life in the die-casting process. Other added alloys are small amounts of titanium, copper, and magnesium. After alloying, the molten metal is poured into sow molds and ingot molds. Sows can weigh several thousand pounds, while ingots weigh about 45 pounds (20 kg). Metal alloys are inspected by a process called spectrographic analysis. The metal is burned under a protective cover using an electrical arc. The light emitted by the burning metal is passed though an apparatus much like a prism, which breaks the light into all of its individual colors. Every element has a different set of colors, or spectrum, which is like a fingerprint. Any foreign material will alter the spectrum, and in doing so show its unique color spectrum, identifying it. The computer in the spectrograph uses sensors to pick up these colors. The computer program then produces a printout that identifies each element in the spectrum and the concentration within the metal. Elements can be reduced or increased to alter the composition. Because of the strength to weight ratio of zinc, its use by the automotive industry as a die casting has been diminishing in the past few years. Magnesium, aluminum, and plastics have taken over many zinc applications. The use of zinc to galvanize automobile body parts has been increasing, however. Many vehicles today are protected by zinc galvanizing which allows the manufacturer to offer extended warranties for body rust problems with new cars. Queneau, Paul B. and Jerome P. Downey. "Secondary Zinc Production Minimizes Waste." Pollution Engineering, November 1994, pp. 42-44. Yates, Edward M. "Zinc: Major Mine Production Cuts in 1993." Engineering and Mining Journal, March 1994, pp. 19-21. Zinc was discovered in 1500 by Andreas Margraff in Germany. Its the most common element in the earth's crust. Its boiling temperature is 907 degrees C.